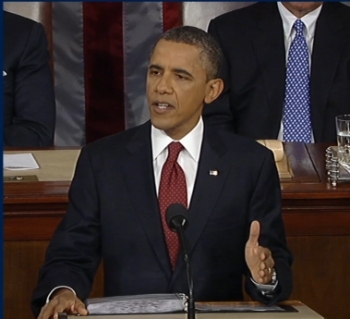 President Obama raised the issue of international piracy in last night's State of The Union address to the U.S. Congress. Speaking to the nation in his State of the Union address to Congress, President Obama last night referenced U.S. efforts to combat piracy. Although the remarks were in the context of battling knock-off goods that infringe trademarks and affect American manufacturing jobs, Obama delivered the message just days after the Justice Department brought racketeering and copyright-conspiracy charges in the Megaupload international piracy case — and the hacker’s group “Anonymous” retaliated by bringing DDoS attacks against government and other sites. Megaupload principal Kim Dotcom yesterday was denied bail in New Zealand, the country in which he was arrested on U.S. charges that Megauplaod had amassed at least $175 million through international web piracy. Obama referred to neither the Megaupload case nor the follow-up DDoS attacks. But the President did signal that the United States would not stand by idly and submit to the whims of pirates who seek to hide behind international borders and gorge themselves on profits derived from U.S. ingenuity. “It’s not right when another country lets our movies, music, and software be pirated,” the President said. Megaupload and related entities operated websites that caused at least $500 million in economic harm to U.S. companies by unlawfully reproducing and distributing “infringing copies of copyrighted works, including movies – often before their theatrical release – music, television programs, electronic books, and business and entertainment software on a massive scale,” the Justice Department said last week. “The conspirators’ content hosting site, Megaupload.com, is advertised as having more than one billion visits to the site, more than 150 million registered users, 50 million daily visitors and accounting for four percent of the total traffic on the Internet,” the Justice Department said. Law enforcement last week executed 20 search warrants in eight countries, including the United States. At least $50 million in assets and 18 domain names were seized, and servers in Canada, the Netherlands and the United States were targeted by investigators to freeze the fraud in its tracks, the Justice Department said. Obama also signaled that his administration’s overall fraud crackdown will continue and the the United States would dial up efforts to bring financial criminals to justice. Congress, he said, should stiffen fraud penalties. “We’ll also establish a Financial Crimes Unit of highly trained investigators to crack down on large-scale fraud and protect people’s investments,” Obama said. “Some financial firms violate major anti-fraud laws because there’s no real penalty for being a repeat offender. That’s bad for consumers, and it’s bad for the vast majority of bankers and financial service professionals who do the right thing. So pass legislation that makes the penalties for fraud count. The word “fraud” appeared four times in a White House transcript of Obama’s speech. It did not appear at all in the Republican response, which was delivered by Indiana Gov. Mitch Daniels and questioned where the United States would get the money to pay for programs in an era of runaway budget deficits. The government does too much meddling in business and engages in unrestrained spending, Daniels suggested. “In three short years, an unprecedented explosion of spending, with borrowed money, has added trillions to an already unaffordable national debt. And yet the president has put us on a course to make it radically worse in the years ahead,” Daniels said, according to a CNN transcript. “In word and deed, the president and his allies tell us that we just cannot handle ourselves in this complex, perilous world without their benevolent protection,” Daniels said. “Left to ourselves, we might pick the wrong health insurance, the wrong mortgage, the wrong school for our kids; why, unless they stop us, we might pick the wrong light bulb. A highlight of last night’s State of the Union address was an emotional appearance by Rep. Gabrielle Giffords in the House Chamber. Giffords was shot in an assassination attempt a year ago. Still in the process of recovering from her wounds at the hands of a deranged man with a gun, she is leaving the Congress. U.S. District Judge John Roll was killed in the same attack, as were a nine-year-old girl, three senior citizens in their seventies and a 30-year-old Congressional aide engaged to be married. What neither side appears to agree on is how best to address polarization, kickstart the economy, regulate the U.S. markets and equip agencies to meet modern challenges, including the unique challenges of the Internet age. Megaupload is just one of many sites doing exactly the same thing. In the past thirty years they have failed to stop the pirating of movies, music etc.., so what makes them think that they can stop it now? Back in the days before there was internet Movies, Music and Applications were being pirated much like they are today just at a slower pace since there was only dialup at 2400,9600 and then 14.4 baud rate and one only had to search the 10,000 BBS sites to find what now takes seconds to find. The Government has busted many of the big groups that pirate software, movies and music and it has had little or no effect on what is being distributed. Knock down one group of players and new ones appear and life goes on as it did before. And to those of you who think that they have accomplished anything with this Great Raid then take a look at this site: [deleted by admin] and think of the 10,000 other sites just like it or if you want to watch last years movies go to crackle.com its free. The Government needs to stop protecting big business who puts little or nothing back into the economy and protect our citizens against all the online fraud (which they have failed to make a dent in)let alone stop. Jack, if i remember correctly, Bob Guenther once accused you of making a living by bootlegging DVD’s. And we all know Bob’s level of investigative skills, nonexistent. I don’t think he ever figured out who I am. But piracy, in its many forms. is a real problem worldwide. Patrick has his fair share of people using his copyrighted material, as have I. But internet censorship isn’t the way to go, either. Piracy is indeed a problem, especially when it comes to the protection of the rights of writers, journalists, song writers, musicians, poets, artists etc etc. Eually any protection against fraud is more than welcome. I have no problem with the detention of the Megaupload bunch, but agree wholeheartedly with Jack that the SOPA lobby and the protection of corporate interest is another story. (Hollywood has now threatened to withdraw campaign contibutions because of the withdrawal of SOPA…puhleez!) How many of those corporations are now offshore any paying nothing into the US system?? And just a small comment ““It’s not right when another country lets our movies, music, and software be pirated,” the President said.” Peeps there is a great big world out there and not everything pirated was invented or created by americans. The rest of us get pirated too, but it is always the little guy that suffers because governments traditionally protect the large corporations. A protection for the average citizen would be far more constructive. More money for online fraud investigation I say and let the corporations sort themselves out. Yes you are right about our little buddy Bobby and his great investigative skills. Unfortunately, I do not make a living off of pirated software and must try to live off of my social security. For years our Government has been pirating the money from SS and have yet to pay any of it back. The old saying about people in glass houses should not throw stones fits our Government very well. Having ventured into the dark side of the net I am well aware that any and all efforts to stop pirating is another way for the Republicans and the Democrats to waste money and will accomplish little or nothing to stem the flow. What many of my fellow Americans fail to understand is that 90% of all pirated movies, music and software is from Russia. Lets look at why. 1. Before any of the movies that are now playing in the US they are released overseas sometimes a few weeks before us. 3. Employees of companies hired to make retail copies for sale upload to various sites for the glory. As to the pirating of software the main reason is to try before you buy the full version since most trial-ware is limited. How many times have you bought software that made all kinds of claims as to what it would do and then found out that it did not work as advertised? What recourse do you have? None! You can not get your money back and most of the time NO SUPPORT to resolve the issues. Protect us not them!! Can a family afford to take their kids to the theater to see a movie? Not where I live. A family of three will spend on average about $60.00 to see a movie. How much food will that buy or what bills will you not pay? Will The US Government Sabotage The Cloud? It’s not just entertainment that gets pirated, although those industries seem to take it more personally. Globally, about 40% of all software is presumed pirated. Yet, Microsoft (NASDAQ: MSFT.US), which has typically supported stricter copyright protection, decided SOPA went too far and convinced the Business Software Alliance to withdraw its support. Cloud computing is the current big thing with some businesses. Or at least it was. The problem with SOPA seems to be that, as written, it would allow authorities to carryout an electronic version of a SWAT team invading the wrong house,without any responsibility the innocent parties that were collaterally damaged. Legitimate cloud storage is a wonderful thing, though. The first thing I thought of when I heard this story was how much of my own stuff is stored at Amazon.com. I no longer buy CDs, DVDs or books for the most part, if I want something, I buy it from Amazon and then I have access to it through my computer, a Blue Ray player connected to the internet, Kindle or my ROKU device. This is a sea change in how things work, and before long I can see I’ll never buy a new disc player etc… only a device like the ROKU that costs less than $40 and can play all my content on all my devices. Trust me, in 10 years, if not sooner, any kind of player that makes you have a physical media will be as ancient as 8 Track seems now.